Solution 1 - CipherLab Co., Ltd.
CipherLab 9700 Series Helps Achieve Cost-cutting on Reworking as Accuracy in Assembly Line and Inventory Control is Leveled up. Founded in 1981, the company is a global manufacturer of mobile devices and internet service provider. With more than 15,000 employees worldwide, the company has built up leading SMT production lines and MMI automatic testing systems, and thus becomes one of the largest smartphone manufactures in China. In 2015, the company's revenue achieved $1.62 billion and was ranked as one of Top 10 global smartphone manufacturers by IDC (International Data Corporation) according to its sales volume. 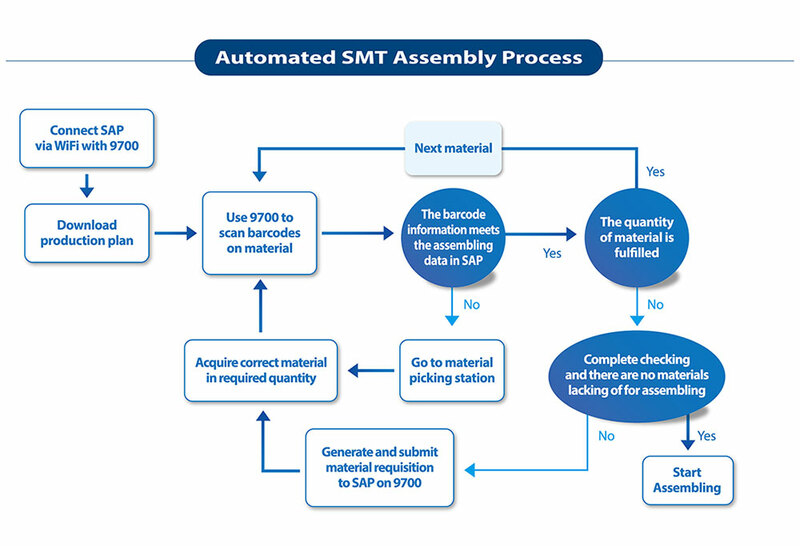 To deliver such a huge amount of sales volume, the company has to further raise plants' production capacity, and find solutions for the biggest challenges they have encountered in their SMT assembly line and inventory management. It's SAP that the company adopted as ERP system, where correct data entries are required to make sure every material is on the right track. However, the mistakes caused by paperwork and manual data entries threaten the overall productivity and they are getting worse at the same time with the growing sales volume. Wrong data entries happening during the process of parts dispensing get wrong parts to be dispensed to a wrong assembly line. Moreover, the workers in assembly lines are lack of tools to do double confirmation before starting assembling. Finally, wrong products are produced and then waste of time and workforce in reworking is inevitable, which has become a hindrance to higher productivity. The receiving and put away tasks of inventory management are also error-prone due to manual paperwork. The workers need to write down the receiving items, quantities, and shelf numbers, and update SAP system by laptop or computer afterwards. 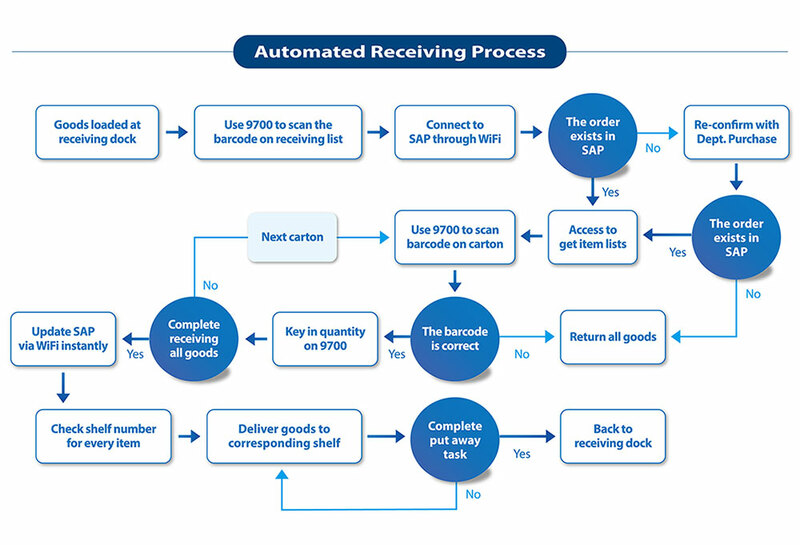 The need to repetitive manual process increases the opportunities to create inconsistency between actual stocks and SAP system, while the wrongly-located items in storage also increase. CipherLab 9700 series mobile computer is proposed to replace paperwork and provide wireless connection for real-time visibility. As one of the candidates, the 9700 series chosen due to its superior scanning performance, long working hours, industrial ruggedness and great compatibility with user's systems. With a big amount of materials from various suppliers, the company receives numerous tags with different barcode types printed on different paper. Some of them are even printed on color paper. The 9700 series with laser reader allows inventory and assembling workers to capture all barcodes effortlessly and eliminates unnecessary paperwork. It also provides three kinds of scanning notifications, including LED, beeper and vibration, to further make sure the accuracy. To meet demands of long-time and scan-intensive operation at warehouse and assembly line, the 9700 series is equipped with 3600 mAh battery, which can work continuously for minimum 13 hours to run beyond one work shift. Considering about future potential demands, the peripheral of 4-slot battery charger can aggressively extend the 9700's working hours. Regardless of an assembly line or a stock area, the 9700 series is able to sustain dust, dirt and water under the protection of IP65. The device downtime caused by accidental drops can also be diminished while the 9700 series gets over the tests of multiple drops at 1.8 m and 1000 tumbles at 0.5 m.
The 9700 series can operate on both Windows® CE 6.0 and Windows® Embedded Handheld 6.5 platforms so that it's easily for the company to migrate their applications to the 9700 series without worries. Moreover, the utilities of device management from third party or CipherLab make it efficient for MIS manager to manage all distributed devices. 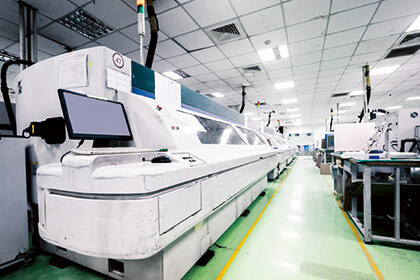 At the 1st stage, 84 units of CipherLab 9700 series have been deployed and the improvement of accuracy is apparent in inventory control and material dispensing for SMT assembly line. As the 9700 series shows its value for all practical purposes, another electronic company, which belongs to the same parent company, has consulted CipherLab about 9700 series for its issue in inventory management.